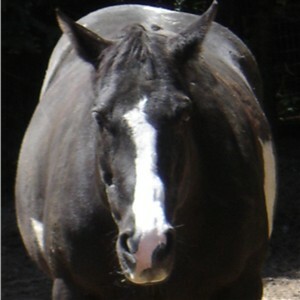 Equine choke is the blockage of the esophagus by food or foreign object, usually food. Yikes! Horses most often choke on dry grain that is greedily eaten or hay that is improperly chewed. Horses that need their teeth floated or have a habit of eating too quickly are at greater risk for choke. Horses at the bottom of the pecking order, who are worried about getting their fair share at meal times, often bolt down their grain before they are chased off by a dominant pasture mate. Try not to panic! Your horse can still breathe, he just can’t swallow. Oftentimes the food will soften with saliva and go down on its own. If not resolved quickly get your horse to the vet. First your veterinarian will determine if the equine choke is due to food or a foreign object. If it proves to be food, your vet will most likely sedate the animal to allow for relaxation of the muscles of the throat. If the food does not pass on its own, the vet may gently push it down with warm water and a stomach tube. She may also give your horse antibiotics. This is to prevent infection from any food particles that may have been inhaled into the lungs. 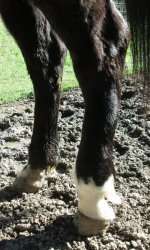 Long-term problems can occur if the horse is not treated quickly and properly or the horse has had repeated episodes of choke. Food that is held in the throat too long can cause tightening of the area (stricture) or scarring. This can be accompanied by the development of a bubble or a pouch, called a diverticulum, which would tend to act as a food cache. This can perpetuate equine choke. If you have a horse that is prone to choke, feed them wet mash-type grains, a fine stemmed type hay that is easier to chew. 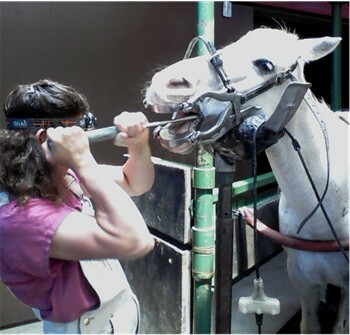 Keep them up to date on any needed equine dentistry. Make sure your animal has free access to plenty of fresh clean water. If you suspect your horse is eating too quickly because they are worried about being chased off their food by the other horses, feed them in a separate area where they can learn to relax and chew their food properly. Learn how to stop coprophagia...the act of eating horse poop. 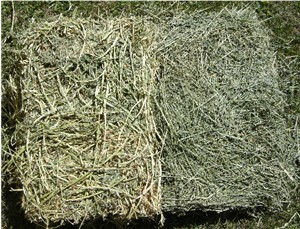 Learn the difference between alfalfa and grass hay. What is quality and what is not. 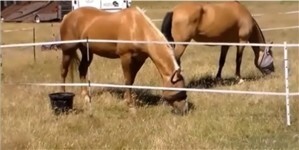 All about floating horses' teeth, what it is and why it's done. 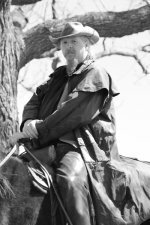 This information is written for the horseman to better understand and cope with the variety of disease and injury that can occur during the course of horse ownership. Always consult with your Veterinarian regarding the care and treatment of your equine.